Welcome to the official website of artist Dede Farrar, M.F.A. Her work is about the land, people and animals of the great American West and her travels throughout the world. Working A Single, the painting shown, won second place (2016) in the Meeker Sheepdog Classic International Art Show. This piece is an example illustrating how the landscape and culture of the Western United States influences the subject matter of the artist's work. 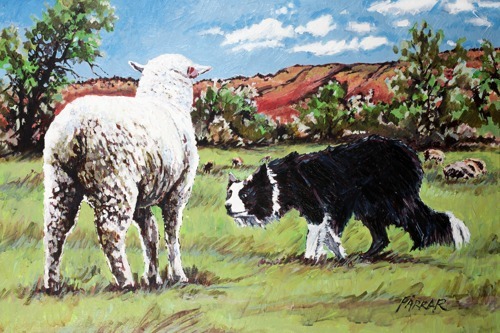 A border collie stock dog separates a sheep from the herd showing the working bond between stock dog and human. The beautiful colors of the Wyoming landscape that the artist photographs on her adventurous travels further complete the painting. Dede Farrar continues to earn top honors in her region and travels to many shows and outdoor festivals. Recently, she has been accepted as a member of Artists of the Black Hills. Stay tuned for more beautiful paintings to come and feel free to sign up to her email list so you can see new works when they are released. Follow her Facebook page Art Works by Dede Farrar and see how a working artist lives day to day, struggles, triumphs and all. Enjoy your journey through her creations by visiting the galleries.